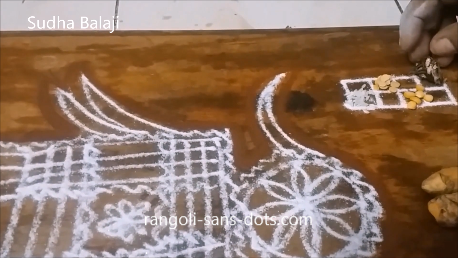 We draw a ratham rangoli for this festival. First take a plank or manai that we use in our house for Puja. Clean it well. 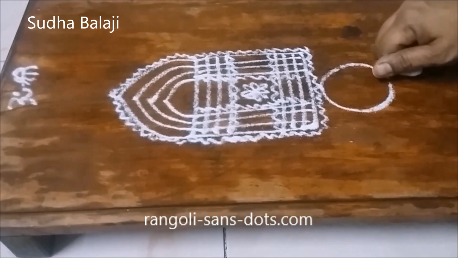 Draw a traditional ratham rangoli using lines. Invariably we draw one line for the ratham , this actually denotes the chariot of the Sun God. We draw one wheel to show that the Sun moves slowly !. Draw the pennant or flag like design with the Sun design inside. Draw plantain trees on either side of the chariot. Decorate with kaavi as we do for all festivals. 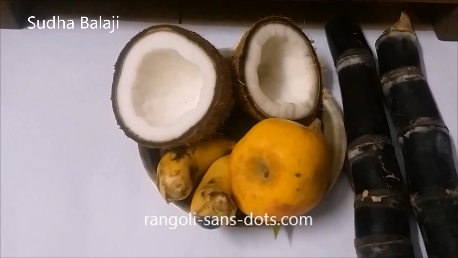 Traditionally we use coconut fibre to draw the kaavi or geru , nowadays cotton bud is used. Draw squares as shown at the top right. In the squares place, rice, pulses , jaggery, tamarind . We also place jujube fruits. The idea is that we offer freshly harvested rice and pulses to the Sun God . We believe that it is because of Him we are blessed with food. Scientifically it is true also. Place two turmeric seeds also. Offerings include betel leaves ( two or four ) areca nuts, fruits, sugar cane and coconut and of course jujubes. Pictures of Sun God are available in the market. We can purchase one picture and fix it in a frame. The photo is cleaned , sandalwood paste, turmeric powder , kumkum are applied. Floral decoration is done. We can also decorate with cotton garland or vastra. Songs for Pooja can be from Telugu, Kannada or any language. Traditionally a pair of lamps or lit i.e minimum two lamps are lit as shown , if they are small. 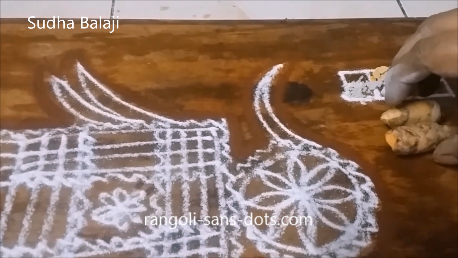 Also keep them in plates so that oil does not spill on the Pooja slab or plank in this case. Some follow the tradition of giving "van" or gifts to a Sumangali or Suhasini for Sankranthi. If they miss for Sankranti they can give it for Rathasapthami. This video shows what can be offered for this gift.